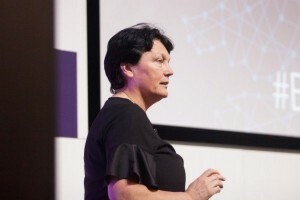 Earlier this year, Women in Banking and Finance and Lloyds Banking Group hosted a hackathon to mobilise change for women in the workplace. Over 300 women and manbassadors from across the tech, finance, banking and charity sectors joined forces to hack key issues hampering gender equality and fairness of opportunity. Four key areas were tackled and will form the basis of a series of papers called “Inclusion and Diversity in Tech: The Levers of Change”. The first focuses on imposter syndrome. 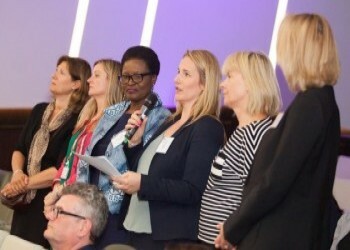 “Earlier this year I was honoured to speak at the WIBF Banking on Diversity in Tech hackathon, a brilliant event focused on mobilising the levers of change for improving inclusion and diversity. As part of the day we were privileged to hear from thought leaders from across the banking, finance and tech industries, but most importantly from the hundreds of participants there on the day. We spoke about how to drive change in the systems we work in, as well as within ourselves as individuals. I am a firm believer that you need to change both of these to make a real impact. In 1978 the concept of ‘Imposter Syndrome’ was first coined. Two psychologists had spent a year observing a group of high-achieving women and had noticed that while the women showed traits of high-performance, competence and tenacity, behind the scenes they had low-confidence, doubt and crippling anxiety. At the heart of this was the feeling that the women didn’t belong in their workplaces and didn’t deserve any recognition they achieved. Of course, imposter syndrome itself has been around far longer than just forty years; for centuries, she’s have been hidden behind he’s. By some estimates, 70% of people have experienced impostor syndrome in their careers at one point or another. Leading figures like Meryl Streep, Maya Angelou, Albert Einstein and Larry Page, chief Google exec have shared their ongoing struggles with performance anxiety - remarkable when you consider what they have achieved. Whilst typically associated with women, imposter syndrome can impact anyone, and it’s a growing issue - a third of male and female millennials report it as getting in the way of achieving personal and work-related goals. What does imposter syndrome look like today? 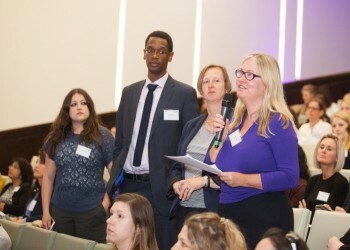 At the BODIT event, many of the attendees admitted that imposter syndrome is real part of the day to day - whether recognising it themselves or by seeing it impact peers and colleagues at work. Stories and symptoms largely fell into two camps - for half, imposter syndrome is something they acknowledge as being a real blocker to progression. A number of women also shared stories of progression avoidance - actively seeking ‘safe’ job opportunities where they can cultivate security, confidence and peer support. For others, insecurities are fuelling their projection of over-confidence and driving a habit of putting themselves forward for extra work in order to appear willing and excited. This cloaks underlying anxiety and unhealthy working behaviours. For their leaders and wider team, this can be a bit of a coup - working hard, over-preparing and humility are traits that are often celebrated by traditional organisations. These behaviours are rewarded and so the cycle continues. Controlling the voice that undermines you is tough, but small steps can help build confidence. Write down your elevator pitch, really sell yourself, and then internalise it. It can become your mantra – use it when you introduce yourself to someone new and to shape your public self. Think about the impact of the language you use day to day – using unassertive verbs: “I think”, “I feel”, “I might” are sure-fire ways to undermine the following opinion. Where possible, turn them into strong verbs such as “I have an idea”, “I will”, “I believe” – this small transition will help you to feel more in control of your outcomes and opinions. Find a trustworthy and inspirational role model who can act as a mentor. Having guidance and fresh perspectives from someone outside of your day-to-day is often illuminating; they can give you the benefit of their experience, help you to forge new connections, as well as the dose of honesty you might need. A different perspective might help you identify when it is time to change and progress, help you to fight for that promotion, or to push back on too many demands. All without the bias of someone who is capitalising on your conscientiousness! Most importantly, they can also inspire. Sharing stories, tips and experience is a great way to work through challenges and opportunities. 3. Better still, mentor another imposter! Ever presented back at your University or gone to a school reunion? There’s no better way to truly appreciate how far you’ve come than through sharing your journey and knowledge. Mentoring helps to develop trust and raise aspirations for a strong talent pipeline of women for the future. It’s also incredibly rewarding – a great way to give something back to the female community! Research shows that many behaviours are formed during early school years. Much could and should be done in schools to encourage building a positive culture, particularly images and language we are exposed to everyday, whether that’s in the classroom, the media, books, video games etc. Role models, inclusive representation and language also need to start in the classroom - great examples are Detective Dot created by Sophie Deen, Elena Favilli’s “Good Night Stories for Rebel Girls” and TeenTech co-founded by Maggie Philbin. 5. Take comfort that that a lot of people feel like this! One of our hackers read PPE at Oxford and now works for a leading consultancy. After achieving brilliant grades at school, being showered by praise at a top University and making it through a rigorous recruitment process, she has progressed quickly through the company. By many of her friends and peers she is viewed as a resounding success. In actual fact, over the last four years she has suffered from chronic insomnia and panic attacks fuelled by worrying about work. Whilst there are a huge number of similar stories and it is a cause for concern, it is good to know that this is a universal problem. Acknowledging the feelings to peers and leaders can help, in itself, to increase confidence. Training courses on voice and presence can be a great stepping stone to getting there, and everyone has a part to play in growing awareness and understanding. For many, the fear of failure comes from a feeling that they aren’t able to do the job. Some of this stems from the recruitment process; often job descriptions outline the core requirements of the role as well as a number of “nice-to-haves”. Many then feel that, without meeting all requirements, they shouldn’t apply for the job which can leave people feeling demotivated and insecure. If they are successful and get the role, it can make people feel that they are lucky to have been selected for the position and will need to over-compensate. As many of the groups suggested at the event, organisations must start at the beginning of the talent journey to drive change. Job descriptions should outline what is core, versus what is desirable. Other effects of education and getting into employment are comparison and competition. It’s difficult to move away from these ingrained behaviours, but resist the temptation to compare yourself to others. Take the time to understand your whole self, at work and at home, and channel your heightened self-awareness to play to your strengths but acknowledge your development points. Being vocal about both your successes and opportunities to grow will help keep you feel in control of peoples’ perceptions and manage their expectations.